Tanzania Christian Services, Inc. is a non-government organization (NGO) that was started in 2007. The home office address is P.O. Box 107, Monduli, Tanzania. Currently Tanzania Christian Services (AOCSS) operates two non-profit charitable organizations in northern Tanzania; (1) Tanzania Christian Clinic started in March, 2009 and (2) Alpha Omega Christian Secondary School which began operations in 2014. Tanzania Christian Services is governed by a board of directors predominantly made up of Tanzanians. The primary sponsor of TCS is Christian Services Foundation. Funds for Tanzania Christian Services (TCS) are generously donated by individuals, foundations, churches, and other faith based organizations. Christian Services Foundation, an organization based in the U.S.A., plays a major role as the predominant fundraiser for TCS. All members of the foundation’s staff work as unpaid volunteers. Visit the Christian Services Foundation website for more information. Like a maelstrom at sea, the forces of poverty are strong, consuming, and self-perpetuating. 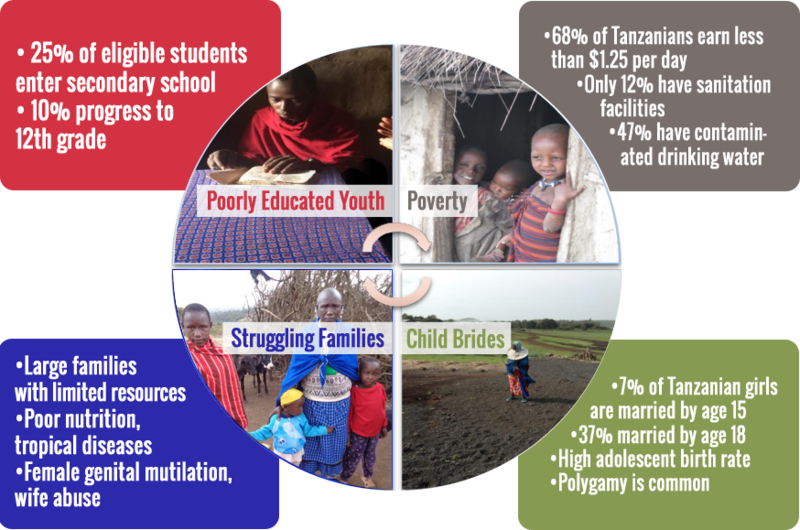 In Tanzania the cycle of poverty (depicted below) affects at least 68% of the population. Additional victims are impoverished every day due to a lack of educational opportunities. If left unchecked, poverty’s strong undertow will continue to overwhelm the next generation, leaving pain and despair in its wake. Is there a way to break this tenacious cycle? Education is an extremely powerful tool that can break the cycle of poverty and allow impoverished individuals to have a brighter hope for their future. With education, a young person can avoid childhood marriage and adolescent parenthood. With education, a graduate can expect an income level that will allow access to better housing, health care, and nutrition. And, with a Christian education, a student may come to know the eternal gift of living water. With these convictions and with God’s blessings, Alpha Omega Christian Secondary School of Science opened its doors in January, 2016. Goals for the school are (1) to break the poverty cycle, one student at a time; (2) to prepare Christian youth for leadership opportunities in their community and nation; and (3) to emphasize excellence in the sciences so that AOCSS graduates may pursue careers in health care, engineering and other related fields. AOCSS is a Christian, coeducational, secondary (high) school with boarding students. The campus is located near the rural town of Monduli in northern Tanzania. AOCSS is organized as a subsidiary organization functioning under the supervision of Tanzania Christian Services, Inc. (TCS), a non-profit NGO. In addition to AOCSS, the NGO also operates Tanzania Christian Clinic, a charitable health center in Monduli. Jesus said “To whom much is given, much will be required”. When you choose to give to Tanzania Christian Services, both you and impoverished students will be blessed. Will you join us in sharing a Christian service? We invite you to donate $50, $100, $250 or even more to help us lay this foundation of hope. The patients and students say “Asante sana” (thanks much). © 2016 Tanzania Christian Services, Inc.